(NaturalNews) With less than six weeks remaining, thousands of volunteers are scrambling to acquire as many signatures as possible for the #SB277Referendum, a petition that could overturn Californian's forced vaccination bill. 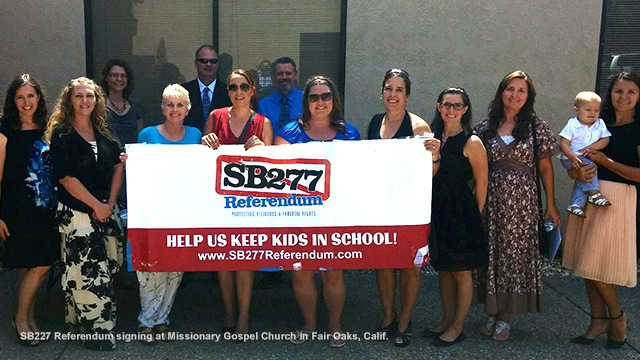 Led by Libertarian Tim Donnelley, opponents of SB277 joined forces to launch the petition July 1 in response to the recently passed unconstitutional vaccine mandate law, which eliminates a parent's choice to not vaccinate their children due to philosophical or religious beliefs. In order to be successful, the petition needs 365,880 verifiable signatures by September 28. If they reach their goal, the measure will be placed on the November 2016 ballot, allowing Californians to hit the polls and decide for themselves. Find out where you can sign the petition here. More than 4,000 volunteers in 45 counties are assisting with the effort as they try to garner signatures in grocery stores, shopping malls, restaurants and other public places. However, not all businesses have been the most accommodating; in fact some have been downright nasty. Sources with the SB277 Referendum effort told Natural News that, while some businesses have allowed them to collect signatures on their property, others have asked them to leave, including Panera Bread, Safeway, Trader Joe's and Whole Foods, which stated that they do not support petitioner's rights to be there, even in public areas. The response to the referendum isn't all negative, however, as Louis Marinelli, who is running for California State Assembly in the 80th District, signed in support of revoking SB277. However, Congressman Jerry McNerney, another California politician, failed to offer the same support, which you can hear for yourself in a YouTube video uploaded by activist and petition gatherer Andrew Liebich. Rep. Jerry McNerney hosted a "Congress at Your Corner" event in Lodi, California, on August 20, at which Liebich was armed and ready with his petition, a clipboard and his camera phone. Liebich decided to ask Congressman McNerney if he would sign the petition, but the response he received was not what he expected. After a brief introduction, Liebich politely informs McNerney about the referendum, but McNerney cuts him off asking, "So you want to make it into a referendum?" "We are, we're halfway through the referendum process right now which is a 90 day...," replies Liebich. "Ok, what does it do?" asks McNerney. "The referendum process basically just puts it on the ballot so the voters can vote on it," says Liebich. "Yeah, I know what the process does, what's in the referendum, what's in it?" asks McNerney with a slightly agitated tone. "It's the mandatory vaccine bill," says Liebich. "There's 10 mandatory shots now that every child from preschool to high school is required to take, and if the parent skips one, or delays one, the child is now kicked out of school," says Liebich. "Well, that's sufficient justification," says McNerney. "We think it should be their parent's choice to decide what they inject into a child. California's vaccine rate is 97.4 percent and Senator Pan testified himself that herd immunity is achieved at 92 percent," says Liebich. "Well, you know my son had a pretty strong reaction to the pertussis vaccine. He had convulsions, and all, and so we didn't give him the third round of that because of that," says McNerney. "There should be ways for a justified [sic] parents to justify not having them," says McNerney. "Unfortunately, in your circumstance, where you skipped that third vaccine, you no longer have if you're a resident of California; you no longer have that option," says Liebich. "Well, um," says McNerney as he clears his throat uncomfortably. "So we're gathering 366,000 signatures and if they're in by September 28, it gets put on the 2016 presidential ballot and the people of California will be allowed to vote on it," Liebich explains. "So, I'm wondering if you'll sign my petition," asks Liebich. "I don't... I don't sign petitions," McNerney says. "I don't do that," says McNerney. "Why is that?" asks Liebich. "It's too politically charged for me to do that, I'm sorry, can't do it," says McNerney, adding that he's not against the petition but knows Dr. Pan and believes that he has the "best intentions." "I don't know enough about what's in that bill or in the referendum to be able to say that..." McNerney says. Liebich manages to convince McNerney to take a pamphlet on the referendum, but the politician follows the exchange with "I mean, it is a state issue, it's not a federal issue, but I'll take a look at that." The message here is that the law only applies to the peasants of California, and not to those in positions of authority. Are you going to let the state wage vaccine violence against your child? Sign the petition now and encourage EVERYONE you know living in California to do the same. Time is running out. "Like" the #SB277Referendum Facebook and Twitter pages for updates. You can also tweet @RepMcNerney and let him know how you feel about his refusal to sign the petition in light of him experiencing vaccine injury first hand. For more information, visit VaccineDamage.news, powered by FETCH.news.